This New Year, Enjoy the Gift of Revisions! Revising a novel, short story, or even blog article is never fun. Just writing this, I’m thinking about what Chantel is likely to do with this blog once I’ve finished it, and I’ve only just started! The truth, though, is revisions are necessary! Even the best writer needs a second, third, fourth, or even tenth chance to look back and make changes—to have someone else take a look and point out places where clarity is lacking or the pacing is off. And while we all know there’s nothing worse than putting your soul on paper and asking someone to strip that soul down as if they were peeling a banana for a snack, the truth is, revisions are a gift. When you have the chance to rewrite and rewrite and rewrite, you uncover a final product that’s better than ever—a soul fully formed. 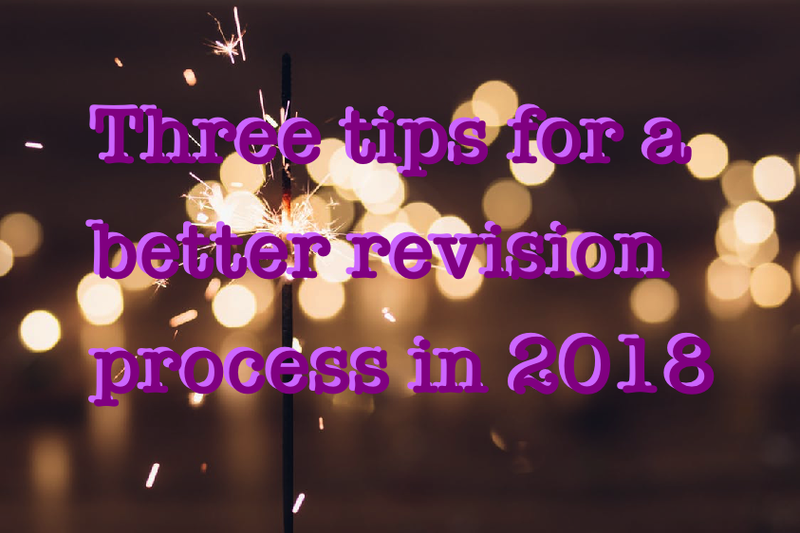 This new year, as you settle on your resolutions, or perhaps simply a word to live by in 2018, think about revising your opinion of revisions. Make a promise to trust only the best people to read and review your work—people who will handle that new soul with care, and give advice and opinions with compassion and selflessness. Then, knowing their revisions were given in earnest, vow to look forward to the coming stage of revisions with positivity and purpose. Something good is happening. Your work is coming into its own. With that light at the end of the tunnel in mind, here are a few HigleyFox tips for getting through your revisions with gratitude in 2018. Tip 1: Don’t respond too soon. Currently, Chantel and I both work 9–5 office jobs. I’m a copywriter for a local tech company here in Boise, so you could say I’m familiar with revisions. In fact, while my job title might be copywriter, I’d say I only spend about half my time actually writing. The other half is spent making revisions—both in revising my own work prior to sending it over to our in-house editor, and making changes in response to her comments on my work. Using easy math, that’s around 20 hours a week spent on finessing work that was “finished” some time before. All this is to say I understand what it’s like when a piece of writing you’ve worked really hard on comes back with notes. It doesn’t feel great, even when you know the person who left them gave them with the best of intentions. That’s why, on occasion, if I know I’m still too close to the piece, I let it sit for a time. Sometimes that’s a couple of hours, sometimes it’s overnight. It helps me to open the document and scroll a little way down first. Then, as soon as I start to feel that small twinge of annoyance or defensiveness, I put it aside. Those feelings aren’t going to help me make thoughtful revisions. When I’m ready, I return to the document with a cool head, and often, I find the edits aren’t as bad as I made them out to be. As I go through, I pay special attention to comments that relight my flame of indignation. The editor isn’t following? How could they not be following?! There’s nothing wrong with the words currently on the page! When I start having thoughts like these, I take another pause. There likely is something wrong with that section, or the editor wouldn’t have said something. These are the comments I leave until the end. This is my personal preference. It gives me the chance to take care of the easy stuff and mull over the problems I’ll need to address later. When I’ve finished all the easy changes, I go back. Sometimes I make a response to the comment that’s been left, explaining what I meant and perhaps even restating the point in a step-by-step manner. It’s often in doing this—rewriting my point in a snarky response—that I realize what’s missing. A good rule of thumb is, if you have to explain something to your reader after the fact, your original phrasing isn’t doing its job. Still, sometimes you have to write out your intent in order to fully understand the problem. Once you’ve reached that moment of clarity, erase whatever curse words you’ve written in response and take a stab at revising. This brings us to tip No. 2. Tip 2: Reword, even if just for the heck of it. It’s hard not to take yourself too seriously as a writer. As much as we’d like to check our egos at the door, there’s something about walking the same path of punctuation and language used by great authors like John Steinbeck and Jane Austen that makes us think—even secretly—our words are special and lasting. It’s best to get over that mindset as quickly as possible. When you’re making a revision you don’t like or even necessarily agree with, do yourself a favor, and just do it, even if it’s in a separate document or in suggestion mode. Then see what you think. If you’ve really got out of your own way and allowed yourself to jump into the revision, you may find you’ve answered the editor’s comment and taken it a step further. Is it better? Do you like it more? If you find you’re still struggling, put it aside and give it another go later. If, even then, you find you still like your first attempt best, let the editor know you’re struggling with that particular revision; don’t just ignore it. Now that you’ve taken a hard look at it, you’ll likely know what about that section is making it so difficult to let go. With the right words to explain your point, you and the editor can have a thoughtful conversation about why they saw the need for a change and why you like the section as-is. Maybe you can take a look at that part together and figure out not only if a change is really needed, but what exactly that change should be. Whether your editor is a friend, family member, or one of us here at HigleyFox, that person is pretty smart. And between the two of you, you’re sure to get to the bottom of those tougher revisions. Tip 3: Don’t always settle for your first revision. This is especially true before you send your work over to someone else to read. Before I send this blog to Chantel, I’ll have reworked some sections two or three times. If you’ve had someone comment on your work before, it’s a good time to keep in mind your own vices and read with a wary eye. For me, it’s wordiness. As I reread this blog, I’ll be thinking about where I can tighten up my points. Where have I led a sentence on too long? Are there areas where I’m redundant? Is there a good mix of short sentences and long sentences? There is, of course, a time to put the pen down—a time to recognize there’s always more that could be done, but this is good enough. It comes after you’ve made your own changes and then made changes to your work based on others’ suggestions. If you’re self-publishing, your work is finished when the whole thing goes to print. When you’re submitting to a publisher, your work is done when your editor sends you their final thumbs up. Until then, yours is a beautiful, full-of-potential work in progress. It’s an incredible time. This January, we at HigleyFox wish you a year full of revisions—a year to make good great and great even better. Naturally, we’d love to be part of your revision process. If you have a book or blog you’d like us to take a look at, feel free to contact us here on our website, or shoot us an email directly at Queries@HigleyFox.com.